I was thinking this morning ...... about the Ozubulu madness where as a result of a drug-related disagreement, over 11 worshipers were cut down by a gun man while in church one fateful morning. The news of the incident stunned Nigerians and got me thinking. Why does it seem like the virus of madness is becoming an epidemic in Nigeria? It was once Niger Delta militants, then Boko Haram, then Fulani herdsmen and now Ozubulu brothers spilling blood like they do champagne on the head of a Formula One winner. Has every one in Nigeria become a Chief Executive Officer (CEO)? What has a CEO got to do with this again? Some might be thinking. The trend of mass murder in Nigeria reminded me of an article I read in Time Magazine a while back that x-rayed the profession with the most psychopaths. According to the article, CEO is the profession with the most psychopaths followed by Lawyer and Media, while Care aid, Nurse and Therapist have the least. Now you understand where I am coming from. Psychopath ke? Yes, psychopath, translated 'kolomental' in Warri, doesn't just mean someone who cuts you up with a chainsaw or kills 11 people in a church. Psychopath is a personality disorder that has been variously described as characterized by shallow emotions (in particular reduced fear), stress tolerance, lacking empathy, coldheartedness, lacking guilt, egocentricity, superficial character, manipulativeness, irresponsibility, impulsivity and anti-social behaviors such as such parasitic lifestyle and criminality. Don't ask me if the conclusion by Time Magazine study that CEOs are the most psychopaths is 100% correct. For me, juxtaposing their findings and the recent events in Nigeria led me to the conclusion that most Nigerians are either CEOs. Lawyers or Media men or women and are capable of meting out the 'Ozubulu Treatment' at the slightest provocation. I know most people will either want to be CEO, Lawyer or Media man, but I beg you to encourage as many as you can influence to go into the Care industry (nursing, therapist etc) so we can have less psychopaths. As a minimum, you do not have to be a nurse to show compassion because Col 3:12 says 'Therefore, as God's chosen people, holy and dearly loved, clothe yourself with compassion, kindness, humility, gentleness and patience.' We need loads of these vistues in Nigeria. ........Just the thoughts of a certain Wey Mey. A very nice piece Sir. I can't agree less with the fact that majority of the population are already, by your enlightened definition, psychopathic. While the Ozubulu massacare appeared to be a rude shock, which is foreign to our values a a people, I make bold to say that it is in reality a sneak peak of what is to come. Moral depravity has enjoyed full rein and no one seemed to care. Now the things we watched in the foreign movies or on CNN and Aljareeza have come upon us. As Asa sang in her song, fire on the mountain, 'one day the river will overflow and there will be no where for us to go, then we will run run wishing we had put out the fire'. That day is already here already. These are nothing but the consequences of dodging our responsibility, for as Bob Proctor clearly states: We might easily dodge our responsibility, but we can never dodge the consequences of dodging our responsibility. Evil ceases to be evil once pecuniary gains are achieved and shared. Ipsofacto, the parents and clergy eulogize the highest provider and highest tither respectively without thought to the source of the sudden affluence. This is 'champblood' on the altar of Christ. May God help us. Wetin person won talk again? Nigeria is fast turning into a jungle where anything goes. Survival of the fittest. But a decent society is not suppose to be like that. There is hardly no street in Nigeria without at least a church. 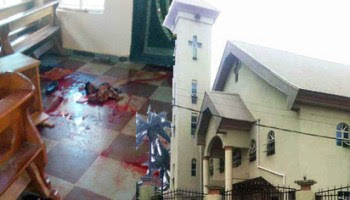 There are proliferation of churches/Mosques (the two major religions in Nigeria) in all nooks and crannies in Nigeria, yet many of the followers of these faiths don't practice what they hear neither does the preachers practice what they preach. The love of materialism has taken over our psyche. This in turn has killed our emotions, gentleness, kindness and all the other good virtues that are suppose to make us humane. Christ said give what's Caesar to Caesar and God's to God. But today, we give Caesar's to God. The implications are what we are reaping today. When the churches/mosques does not care about our source(s) of income but lay emphasis on bring, bring and bring more, what do you expect? Of course, one day the devil will visit and collect some of its proceed. May the souls of the Ozubulu massacre Rest in Perfect Peace, Amen .